Global electric vehicle range extender market expected to reach approximately 554,287 units by 2025, at a CAGR of 10.54% between 2019 and 2025. The electric vehicle range extender is an auxiliary source of power unit invented for electric vehicles, to improve the vehicles’ range in case of exhausted battery capacities after covering a certain distance. The report covers a forecast and an analysis of the electric vehicle range extender market on a global and regional level. The study provides historical data for 2016, 2017, and 2018 along with a forecast from 2019 to 2025 based on revenue (USD Million) and volume (K Units). The study includes drivers and restraints of the electric vehicle range extender market along with the impact they have on the demand over the forecast period. Additionally, the report includes the study of opportunities available in the electric vehicle range extender market on a global level. This report offers a comprehensive analysis of global electric vehicle range extender market along with market trends, drivers, and restraints of the electric vehicle range extender market. This report includes a detailed competitive scenario and product portfolio of the key vendors. To understand the competitive landscape in the market, an analysis of Porter’s Five Forces model for the market has also been included. The study encompasses a market attractiveness analysis, wherein all the segments are benchmarked based on their market size, growth rate, and general attractiveness. The global electric vehicle range extender market is segmented on the basis of product, component, vehicle type, and region. Based on product, the market is segmented into fuel cell range extender, ICE range extender, and others. 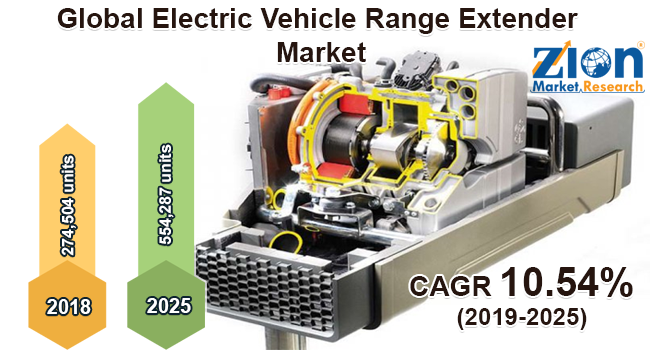 The component segment of the electric vehicle range extender market is majorly divided into electric motor, battery pack, power converter, and generator. By vehicle type, the market includes passenger and commercial vehicles. All the segments have been analyzed based on present and future trends and the market is estimated from 2019 to 2025. The regional segmentation includes the current and forecast demand for North America, Europe, Asia Pacific, Latin America, and the Middle East and Africa. Each region has been further segmented into major countries, such as the U.S., Canada, Mexico, UK, France, Germany, China, India, Japan, South Korea, Brazil, Argentina, and GCC Countries. Some key players of the global electric vehicle range extender market are MAHLE Group, General Motors Company, Rheinmetall Automotive AG, BMW Group, Emoss Mobile Systems BV, Magna International Inc., Plug Power Inc., AVL LIST GmbH, Nissan Motors Corporation, and Volvo Car Corporation.